November 2010 saw me, having recovered fully from the rejection episode, attempt to get a lens to wear in the grafted eye. Owing to HIGHLY complicated prescription and a huge astigmatism the vision in my grafted left eye was rubbish and still could not be corrected with glasses either. I was a bit fed up as two years since the graft although I was technically KC free, my eyesight as no better so I felt almost cheated- had it all been for nothing? I had had all the stitches out by now except the very deep ones, and the graft was clear and healthy according to Mr Teimory. I had seen the excellent Mr Dunbar for lens fitting up to this point but now I was sent to see Lynne at Thomas H. Collison Ltd a family firm established over 60 years ago and committed to providing high quality, professional eyecare in Worthing. As the NHS Worthing Hospital lens clinic had closed patients are sent to High Street opticians under the HES scheme for contact lens, and Collisons are registered with the appropriate optical professional bodies and strive to meet the standards required as contractors to the local NHS trusts to provide ophthalmic services under the General Optical Service. Lynne is a keratoconus lens fitting expert of many years and she fully understood my various concerns. She was happy with the RGP in my ungrafted eye and suggested as my left grafted eye was so awkward that a newer hybrid lens by Synergeyes would be worth a try. 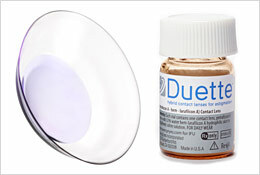 The breakthrough technology of Duette™ by SynergEyes® contact lenses combines two types of materials into one unique lens. The center provides the superior visual acuity of a hard lens, while the soft skirt provides the all-day comfort of a soft contact lens. It was a lengthy process of trial and error and a fair few appointments and disappointments as the lens either didn’t fit but had great vision or did fit but I couldn’t see out of it. Lynne was keen to make sure the balance between both eyes was good as well. Finally in January 2011 we had a lens that appeared to be good for fit and vision, and after all the tests and trials one was ordered. When I finally picked it up and wore it a few weeks later it was an amazing experience. For the first time in YEARS I had decent vision from BOTH eyes TOGETHER. It was almost life changing. And quite emotional. Since then I have had a few tweaks to the prescription but the hybrid remains the best option for me in my grafted eye. I am able to drive at night with few issues, just a little ghosting if tired but this is mostly due to the astigmatism. I try to let the eye rest lens free when i can, and keep it well lubricated, to avoid dry eye and soreness. Sometimes the eye just doesn’t want to wear a lens, so on these bad eye days I can cope with just the RGP in while the other eye calms down. It’s not so bad. Next step for me is exploring the options to improve vision in my grafted eye- as I know that I am on the very edges of being able to get a lens to fit thanks to the astigmatism, and now I have a cataract forming too- which is entirely to be expected in a post graft KC eye. So it isn’t the end of my keratoconus journey quite yet! Thanks for posting, Rae! Hi Wendy! Your story is so inspiring as I only had to get CXL–although it’s not been great, either. You are one strong woman, regardless. I wanted to mentions that hybrids are all the rage in the US, too. 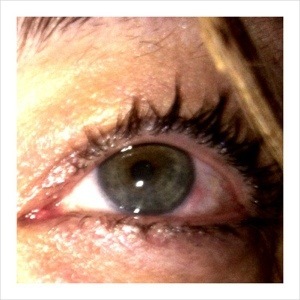 My eyes still haven’t recovered from CXL (no tears going on 6 mos!!! ), so I’m stuck w/o contacts, but I’ll probably be doing this brand’s ClearKone lenses (same concept) if I can’t just do toric soft contacts–I got a lot of VA back so we’ll see. I mentioned hybrids in some post I wrote pre-CXL and I get “searches” on it all the time. I have no experience with them and people seem to be wanting to know about the price mainly–I presume they’re Americans–but food for thought. I know you do well-researched posts! I heard they’re in the thousands over here but they ARE covered as “medically-necessary” contacts with GOOD vision insurance. I upped my coverage to get these and now can’t!!! Just thought I’d mention since I know you do the social networking thing too.. Popular subject for sure and you’re an expert on hybrids I presume.